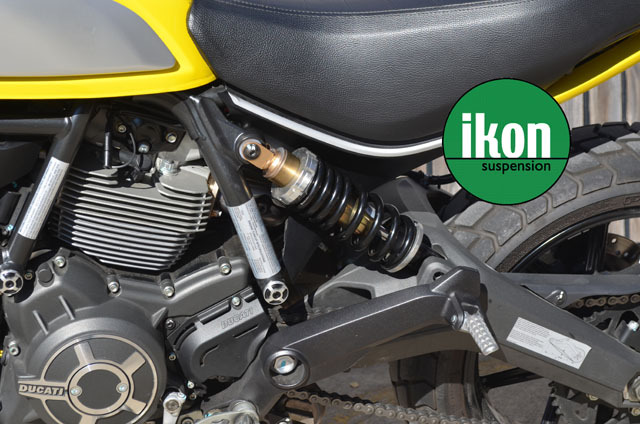 Gas pressurised, fully adjustable and with a progressive spring rate, IKON’s 3610 Series Shock Absorber helps refine the road manners of Ducati’s Scrambler. 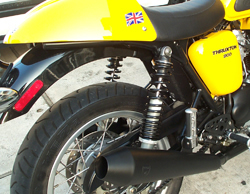 Although it benefits from a steel trellis frame and low centre of gravity, the Scrambler has a basic suspension set-up with minimal adjustment – just pre-load on the rear shock. As a result, the retro roadster can deliver an unforgiving and unsophisticated ride. 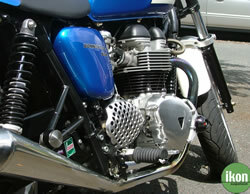 IKON’s 3610 series comes with the much needed adjustment the Scrambler needs, so the rider can tune the bike to his or her own preference and set up for carrying a passenger and/or luggage. 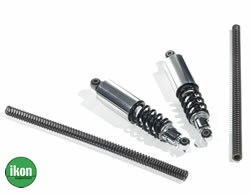 Screw thread pre-load adjustment allows for fine-tuning of the spring to the rider/load, and fully adjustable rebound damping gives a consistent and comfortable ride over a variety of road surfaces. The 3610 is also gas pressurised to help optimise stability, road holding and comfort further still. 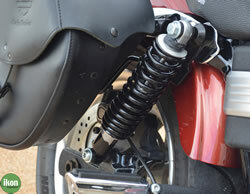 A Triple Rate Progressive Spring also features as standard, to deal with varying loads: when riding solo the spring moves in the softer range giving a more comfortable ride; when carrying a passenger or luggage, the stiffer area moves to compensate for the extra load. Unlike many other after-market shocks, the IKON 3610 is engineered to suit the specific machine’s set-up and character, to ensure the best possible combination of damping and spring rate. And like all IKON shock absorbers, they’re individually dyno tested before leaving the factory, to ensure consistency and quality. They are also rebuildable and can be re-valved. The IKON 3610 comes with a chrome body and black powder-coated narrow series spring, so it sits well with the Scrambler’s vintage lines.